Please use our NSS Amazon links! ANY purchase (books, electronics, etc.) earns a credit for NSS at no cost to you. Bookmark THIS LINK for ALL your Amazon shopping. Opinions expressed are those of the reviewers and do not necessarily reflect the views of the National Space Society. To get a book reviewed by NSS: send query with book description to [email protected] Do NOT send attached files with your query. Do NOT mail books to the NSS address. We usually respond to queries within 10 days. Note: review copies must be provided free. They can be electronic, but books must also be available in print. We are ONLY interested in books about human exploration and settlement of space. 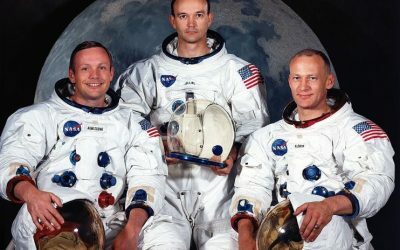 The last six months have brought us two major movies about Apollo 11, and some of its figures: First Man (released October 2018), and Apollo 11 (currently playing in theaters). While this 50th anniversary year will bring many related films, documentaries, and books to the fold, here are five that stand out. The wait is over! In the new book just released today, Space 2.0, space historian and Ad Astra editor Rod Pyle, in collaboration with the National Space Society, provides an inside look at the next few decades of spaceflight and long-term plans for exploration, utilization, and settlement. Space 2.0 is the definitive handbook for the new space age. This novel is the second book of an alternate history trilogy, chronicling the lives of two pilots in a secret Air Force program called Blue Gemini. This trilogy is “hard” science fiction, with care taken to get the technical details right. It all reads as if it really happened. Author Kim Stanley Robinson writes of turmoil, strife, political revolution and poetry on a Moon mostly settled by China. A sensory novel delivering the experience of the alien, both of China for westerners and the lunar environment. Robinson has always been an eclectically intelligent writer and this is a book well worth reading. Reviewed by Peter Spasov. Book Review: Hey-Ho to Mars We’ll Go! Children love nursery rhymes and Hey-Ho to Mars We’ll Go is a captivating version of the classic, The Farmer in the Dell. Parents or other caregivers may sing or simply read the lyrics. This playful story is magical in a scientific way. As we approach the 2019 50th Anniversary of the first landing on the Moon, this beautiful book is a perfect introduction for the younger generation who are not aware of this seminal event or the subsequent missions that followed. Written mostly in verse, it is both informative and visually pleasing, with excellent artwork and actual photographs.